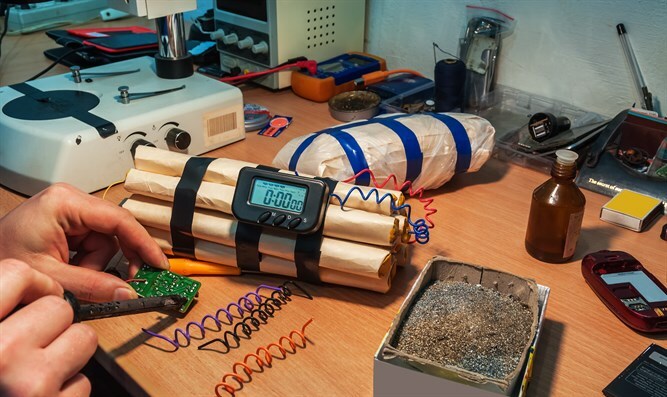 Police detectives discover Bnei Brak man planting explosives in Tel Aviv car. A Bnei Brak resident in his 20s was arrested on Wednesday night as he placed an explosive device in the back of a car on Tel Aviv's Ahi Dakar Street, Kikar Hashabbat reported. The suspect will be brought to Rishon Lezion's Magistrates Court on Thursday, where police are expected to request the extension of his arrest. According to Kikar Hashabbat, Israel Police's Unit of International Crime Investigations collected intelligence arriving via investigators, which led them to a criminal organization aiming to carry out an elimination in Tel Aviv. Detectives following the suspect watched him plant an explosive, and immediately arrested him. Police sappers dealt with the explosives. "Israel Police will continue working determinedly to protect the public safety," an Israel Police spokesperson said.